Ambedkarwadi Lekhak Sangh: is a forum of the dalit writers and intellectuals who are engaged in bringing together the literature of the margins and written by the marginals. In their attempt they have sought to redefine the word Dalit and visualise everyone oppressed as the Dalit, be it the women, transgenders, adivasis or the minorities. They organised the first Dalit Literature Festival in early 2019 at Kirorimal College, Delhi University. Chutka Parmaanu Virodhi Sangarsh Samiti (Chutka, Madhya Pradesh): A movement initiated by people of Chutka & nearby villages and activist Rajkumar Sinha against the proposed Nuclear Plant in Chutka, Madhya Pradesh. This nuclear power project has been proposed for Chutka village in the Mandla district of Madhya Pradesh, whose residents were already displaced by the Bargi Dam. People of Chutka, Tatighat and Kunda have strongly opposed the project since its inception. Dalit Adivasi Shakti Adhikaar Manch (DASAM): As a response to the new wave of the rising assertion of the dalit adivasi power DASAM is an intiative to bring together small and marginal organisations working with the community across the country and intervene in the face of rights violations, seek justice and promote cultural and literary interventions and initiatives. Ghar Bachao Ghar Banao Andolan (Mumbai, Maharashtra): Ghar Bachao Ghar Banao Andolan (GBGBA) was launched as a response to the massive eviction drive that took place in Mumbai, from December 2004 to February 2005. Part of Government’s ambitious plan of transforming Mumbai into Shanghai, this eviction ruthlessly swept away 90,000 hutments, rendering tens of thousands of poor homeless. Protests organised under the leadership of slum dwellers and activists, popularised the slogan, ‘Ghar Bachao Ghar Banao’, soon taking shape of a mass movement. Stirring up the unrest among people, this movement gave way to an agitation fighting for housing rights of the Urban Poor and rebuilding several settlements such as Annabhau Sathenagar, Mandala, Rafiq Nagar, Nirankari Nagar, Sanjay Nagar, Govandi and a major slum called Ambujwadi in Malwani. 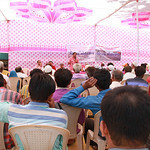 Presently, GBGBA works in over 20 slums of Mumbai. Institute for Democracy and Sustainability (IDS) (New Delhi): An Institute actively working on several aspects of social economic and infrastructural transformation of urban India. It has played a significant role in research, publication and advocacy on policy-making for pedestrians, cyclist, cycle-rickshaws, cycle-rickshaw trollies and public transport. 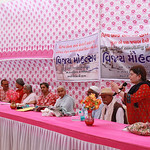 ‘Campaign for Equal Right on Road’ has been one of its important Initiatives. IDS believes that providing opportunities for employment, housing, and education based on the quality and egalitarian ethos is the pre-requisite for the development of an environment-friendly, socio-economically inclusive and eventually, a throbbing city. IDS is a constituent member of National Alliance of People’s Movements (NAPM), Sustainable Urban Mobility Network India (SUMNET), Right to City(Rttc), Car-free Network and other national and international groups. Jan Jagaran Shakti Sangathan (JJSS) (Bihar): A trade union of unorganised sector workers working towards mobilizing rural poor to demand better services from the government and to get the existing entitlements as laid down by the various legislations. JJSS aims to bring about a larger change in the lives of rural poor by means of “sangharsh” (struggle) and “nirman” (constructive activities). 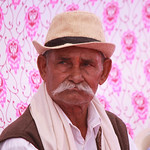 JJSS currently focuses on NREGA, Right to Information (RTI) and issues of justice. Kosi Nav Nirman Manch (Bihar): In the year 2008, many activists and villagers came together during the disastrous Kosi flood in Bihar and set up the organisation for relief and rehabilitation of Kosi flood victims. Since then, they continuously fought for relief from Government during floods and worked out a comprehensive strategy to mitigate the impacts. Koshi Jeevanshalas (Bihar): The model of schools that was started by Narmada Bachao Andolan in Narmada Valley for tribal children has been adopted in Bihar as well, in the villages within or near the Koshi embankments. Koshi Jeevanshalas have been set up in order to provide formal/informal education to those who cannot afford it and are affected due to the construction of embankments on the river Koshi. Right now, 4 Jeevanshalas has been set up which is attended by about 300 students. MGNREGA Mazdoor Union (Varanasi, Uttar Pradesh): A union established to fight for the rights of informal workers in the blocks of Varanasi District of Uttar Pradesh. It was started with a purpose to address the non-employment and non-availability of work under MGNREGA scheme in the district. After people started raising their voices against this, the activists mobilised the informal workers and provided them with a collective platform to fight against the non-implementation of MGNREGA scheme in the district and also demanded other workers’ rights. Narmada Jeevanshalas (Maharashtra and Madhya Pradesh): Jeevanshala, which literally translates to the school of life, was started with an aim to provide primary school education to the adivasi children who hail from villages in the Satpura and Vindhya ranges, many of which are severely affected by submergence area of the Sardar Sarovar Dam. Teachers of these Jeevanshalas are all adivasi youth who bring their socio-cultural knowledge and commitment to the students. Right now there are 7 Jeevanshalas in Maharashtra and 2 in Madhya Pradesh educating more than 900 affected kids altogether. Besides learning the curriculum which is rooted in adivasi culture and environment, these students actively participate, analyse and critique social issues. 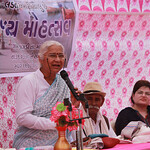 Narmada Bachao Andolan (NBA): A movement initiated by people of Narmada Valley and renowned activist Medha Patkar with support and solidarity from many activists from all over the country. 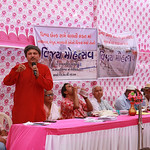 People are fighting against Sardar Sarovar Project which affected the people of Narmada Valley in three states Madhya Pradesh, Gujarat, and Maharashtra from large-scale displacement, environmental degradation, rampant corruption, non-participatory and ill-conceived development through large dams and canals since last three decades. Lakhs of people are still threatened by the impending submergence in the Narmada Valley after the recent closure of Sardar Sarovar Dam gates to its final height of 138.68 meters. Nazariya (New Delhi): A project started to sensitize the work and culture of groups and individuals working on issues of gender-based violence, livelihoods, education, and health from a queer perspective through research & evaluations, capacity building, and advocacy. Pension Parishad (New Delhi): A network of 200 organizations which works for the pension entitlements under National social assistance programme. People’s Resource Centre (New Delhi): PRC has emerged from discussions and interactions among activists, engaged scholars, communities and citizens defending their commons and advocating for another model of “development”. Grounded in the realities and every day resistances of the people, PRC aims to engage and question these dominant paradigm of development and “modernity” which translates concretely into the construction of mega infrastructures projects and subsequent land & ocean grabbing; massive displacements; environmental destruction; commodification of commons; gentrification of urban spaces; privatization of public spaces and so on. Youth for Unity and Voluntary Action (YUVA) (Mumbai and New Delhi): A non-profit development organisation that helps vulnerable groups access their rights. 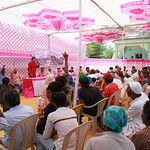 YUVA encourages the formation of people’s collectives to engage them in the development discourse. This work is complemented with advocacy and policy recommendations. It was set up in Mumbai in 1984 and is currently, operating in 5 Indian states.